Giovannino Guareschi (1908-1968) was an Italian journalist, cartoonist and humorist who lived at Parma, near the River Po. He is best known for his Don Camillo books. As he himself explained, his parents wished him to be a naval engineer: consequently he studied law, made a name as a signboard painter, and among other jobs, gave mandolin lessons. His father had a heavy black moustache under his nose; Giovanni grew one just like it. he always wore it and was proud of it. He was not bald, wrote eight books, and was 5' 10" tall. "I also have a brother," he said, adding, "but I prefer not to discuss him. And I have a motor-cycle with four cylinders, an automobile with six cylinders, and a wife and two children." As a young man he drew cartoons for Bertoldo magazine. When the war came he was arrested by the political police for, he says, howling in the streets all one night (He had also been criticising Benito Mussolini's government). In1943 he was drafted into the Italian army and became an artillery officer. After Mussolioni's removal, he was captured by the Germans at Alessandria and says that he then adopted the slogan: "I will not die even if they kill me." He was held in prison camps in Poland for three years, a time he later described in his book Clandestine Diary. Back in Italy after the war, he became editor in chief of Candido magazine in Milan. He criticized and satirised first the Communists, then the Christian Democrats of whom he had been a supporter. In 1954 he was charged with libel for publishing two facsimile wartime letter from a resistance leader and former Prime Minister asking the allies to bomb the outskirts of Rome so as to demoralise German collaborators, as a result of which he spent 409 days in Parma's jail. Starting in 1956, he began spending several months a year in Switzerland because of health problems. In 1961 Candido ceased publication, and the next year Guareschi had his first heart attack. He had his fatal heart attack in 1968. Although he did not usually go to Mass, he was a believing Christian, and firmly anti-Communist. If some of his stories seem a little dated now, it must be remembered that they were mostly written and set in the middle of the Cold War. Don Camillo is a Roman Catholic priest, and "a skilled hunter and fisherman". He is "a big man and about as graceful in his movements as a division of armoured cars". He is "equipped with outsize bones and muscles" and and wears a size 12 shoe. He is able to tear a pack of cards in two, just using his bare hands. His parish is a little village, the author explains, "somewhere in the Valley of the Po River. It is almost any village on that stretch of plain in Northern Italy. There, between the Po and the Apennines, the climate is always the same - the landscape never changes and, in country like this, you can stop along any road for a moment and look at a farmhouse sitting in the midst of maize and hemp and immediately a story is born .... Many things can happen that cannot happen anywhere else. Here, the deep, eternal breathing of the river freshens the air, for both the living and the dead, and even the dogs have souls. If you keep this in mind, you will easily come to know the village priest, Don Camillo, and his adversary, Peppone, the Communist Mayor. You will not be surprised that Christ watches the goings-on from a big cross in the village church and not infrequently talks, and that one man beats the other over the head - but fairly, that is, without hatred - and that in the end the two enemies find they agree about essentials .... If there is anyone who is offended by the conversations of Christ, I can't help it; for the one who speaks in this story is not Christ, but my Christ - that is, the voice of my conscience." The first story about Camillo appeared in Candido magazine for December 23rd, 1946. After it came out, the author tells us that "I received so many letters from my two dozen subscribers that I wrote a second story about the big priest and a big red mayor of the village in the Po River Valley .... Two hundred times I have pulled the strings and make them do the most extravagant things that anyone can imagine. So extravagant that often they are literally true." The stories, which are set in the 1950s and early 1960s, start by being very short, and sometimes rather slight, but they get longer and more realistic, if less comic, in Don Camillo's Dilemma. Many of them are still entertaining, and each sometimes links on to the next in order to tell a continuing story. Occasionally, though, there is a sudden break in the continuity, as when Peppone discovers that he cannot pay for his new premises and has to sell up and work in Milan - but there is no mention of any of this in the next story in which he is as prosperous and firmly established as ever. Comrade Don Camillo, although still first published as a series of magazine stories, is the one book which reads like a continuous novel. It is the amusing, if unlikely, story of how Peppone,who has become a senator (! ), wins the national soccer sweepstakes, and leads a party of ten, including Don Camillo disguised as Comrade Camillo Tarocci, on a visit to Russia, during which Camillo gets elected as leader of a new party cell and causes the maximum upheaval for everyone. As he had told Peppone before they set out, "As far as I'm concerned, I'm hoping it (Russia) isn't as bad as our papers paint it." "Very fine feelings!" exclaimed Peppone sarcastically. "How objective and disinterested you are!" "I'm not disinterested at all," Don Camillo retorted. "It's to my interest that the Russians should be happy. That way they'll stay quietly at home and not go bothering other people." In fact, of course, it is Camillo who is soon bothering them. As he tells Peppone, who has just bought a mismatching but expensive pair of Russian socks: " Beauties! We couldn't make anything half so good. The idea of having one longer than another is particularly clever. No man's feet are exactly the same." It all ends with Camillo's bishop being so impressed by what he has achieved that he tells him, "I'll simply have to raise you to the rank of monsignore." Not that it ever happens. But some other stories, such as the one in which a boy get shot dead by a gamekeeper, or in which a young girl gets run over and killed, are far from funny. And, as in a story about a characterful runaway dog, the reader can get really involved. Much of the entertainment comes from the conflict between Don Camillo and the Communist Mayor, Peppone. It is very much a love-hate relationship, resorting often to the use of physical force on both sides although it is Camillo who turns out to be the stronger fighter. It is only by knocking Peppone out in a fight in the church ("Now, Don Camillo! The point of the jaw! ", the voice from the Lord above the altar encouraged him) that he persuades Peppone not to name his new baby Lenin Libero Antonio. However, in the end, they settle for Libero Camillo Lenin. "Yes, Lenin," as Camillo tells Peppone. "When you have a Camillo around, such folk as he are quite helpless." "Amen," muttered Peppone, gently prodding his jaw. "It's a village just like any other," as Don Camillo explains, "with good people and bad. The only difficulty is in telling which is which." Take Renzo, for example. "Cycling was his only interest, and he knew everything there was to know about it." Every day he pedalled 15 miles to the city and back to buy the daily Sport Gazzette so that he could study the cycling section. "He could have bought it on the village square a little later in the day, but that wouldn't have given him the same joy." Peppone realises that Renzo was such an expert that he could well prove a winner in a TV quiz, so he tries to bribe him with the offer of a road worker's job and a new suit to get him to join the Communist Party. The Christian Democrats offer him a job at the garage and a new suit of clothes if he would join them. The two conflicting groups are even prepared to combine their efforts for the good of the village but "Renzo only shook his head". Finally Don Camillo is persuaded to put their case, but Renzo still refuses to agree: "I have my dignity, Father." "Renzo, if you're giving up all that money, you deserve some recompense. I will hire you as bell-ringer. "Renzo was taken with this idea. What more suitable occupation could he hope to find? He thought it over for five whole minutes and then shook his head. 'I can't do it, Father. The bells have to be rung in the morning, and that's when I go to the city to buy the Sport Gazzette.' .... In matters of stubbornness Don Camillo was something of an expert but in this case all he could do was mutter some semi-biblical phrases about the stiff-necked race of sports fans." The political in-fighting may get rather tedious, although there is an amusing story in which a visiting artist uses a belligerent communist woman as his model for a church Madonna (much to Camillo's dismay), and another in which Camillo refuses to make use of a local band for his religious procession because he had previously heard them playing the Internationale - but actually ends up with four bands. But many of the local characters really do come alive. "Lord," Camillo asked, "who can possibly understand these people?" "I can," the Crucified Christ answered, smiling. Camillo is very much an old-fashioned priest, with simple traditional beliefs, and little interest in, or understanding of, contemporary theological debates. Just "a poor country priest .... (he) had read few books and did not even read many newspapers" - but he knew and understood his local community through and through. He had served as a military chaplain during the war and was never afraid to say what he thought. His bishop tries to keep him in order by sending him away from time to time to a remote mountain village - but he is fighting a losing battle, as the villagers refuse to accept any other priest that they are sent. As he says, "When I put my mind to it, I certainly know how to express myself!". So when Peppone arranges for an important visitor to broadcast communist propaganda from a large platform in the big square and directs loudspeakers right at the church, Camillo drowns out the sound by "leaping and bounding cheerfully in the bell-chamber of the church tower.... performing the most infernal carillon that had ever been heard in the village." Eventually "The bells ceased ringing and the orator resumed his speech and all went well only so long as he was careful to say nothing of which Don Camillo disapproved." When a football match is arranged between the mayor's and the priest's teams, Peppone warns his players, "You have got to win or I shall smash in every one of your faces. The Party orders it for the honour of a downtrodden people!" Then Camillo tells his team, "With the help of God, we shall beat them six goals to none. I make no threats; I merely remind you that the honour of the parish is in your hands. Also in your feet. Therefore let each of you do his duty as a good citizen. Should there be some Barabbas among you who is not ready to give his all even to the last drop of his blood, I shall not indulge in Peppone's histrionics with regard to the smashing of faces. I shall merely kick his backside to a jelly!" Indeed he has quite a habit of kicking offenders. He even sorts out an operatic tenor a who has been singing false notes with "a kick powerful enough to launch a Caruso". Camillo is far from being a conventional saintly figure, and has been known to go poaching and to carry a tommy gun strapped under his cassock. He is quite prepared to don a false beard and moustache and knock out a champion boxer - or even toss a bomb onto the roof of the People's Palace, thus exploding a case of dynamite that had been hidden there, so saving the village from an even worse danger. "Don Camillo," said the Lord, "are you sure that you did the right thing ?" "No," Don Camillo replied. "God leaves man free to choose between right and wrong. I did wrong, I admit it, and I shall repent." "No, Lord," whispered Don Camillo. "It's still too early. I must ask for an extension." The Lord sighed. Come the 1960s, Camillo has little time or patience for the follies of modern youth, such as those of his niece, the dreadful Flora, about whom he has one of his regular chats with the figure of Christ on his big cross: "Dear Lord, if the young people make a joke out of the most serious things in life, what on earth is going to become of your church?" "Don Camillo," the Christ said in a reassuring tone, "don't let yourself be carried away by what appears on television and in the newspapers. The fact is, God does not need men. It is men who have need of God. Light exists even in a world of the blind. As somebody once said, 'Though they have eyes, yet they cannot see'. The light won't go out just because there's nobody to see it." "Well, Sir, tell me why that girl acts like that. Why does she extort, rob, steal and cheat to get something she could have just by asking for it?" "Because, like most young people today, she is dominated by the fear of being judged an honest woman .... Don Camillo, you have to help those who still have faith and keep it intact .... Every day men of many words and no faith are destroying the spiritual heritage and faith of other people. Men of every culture and religion." "Sir, Don Camillo asked, "do you mean to say that the devil is so clever that he can dress as a priest?" "Don Camillo!" the Christ reproved him, smiling, "please, I just went through the agonies of the Vatican Council, do you want me to go through even more torture?" It is only occasionally that Camillo has to act as a detective, as when he comes across a young man whom he distinctly remembers as having buried during the war. He asks the Christ for help. "Don Camillo," replied the Lord with a smile, "do you take Me for a private detective. Why ask God to tell you the truth when you have only to seek it within yourself? Look for it, Don Camillo." So Camillo "took upon himself the role of Sherlock Holmes" and unmasked one of Peppone's plots, as a result of which he "persuades" Peppone to help fund a new church recreation centre. In another story he catches one of the Peppone's supporters breaking into the church, and has to do some real detective work in order to reveal the intruder's real motive, before "giving him a hearty kick in the pants". It is this ability to work out what is going on behind the scenes that accounts for much of his success in his struggles with Peppone - although he realised that "Christ did not altogether approve of his leanings towards the trade of a detective". 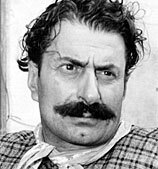 Peppone (Guiseppe Botazzi, born 1899, and much the same age as Don Camillo) is the village blacksmith/mechanic and communist mayor of the little village. He is another large man (he too can tear a pack of cards in half - but only just) and it is he who usually comes out the worse for their encounters. He calls themselves a Christian but is invariably downright rude about the clergy (particularly Don Camillo) and the Pope, but he still encourages his followers to get their children baptized and get married before the altar. Even when one year he decides to ban all Christmas celebrations, he is still careful to explain that "The fact that God chose a carpenter and not a rich man for a father shows that He is deeply democratic .... God is one thing and priests are another. And the danger comes not from God but from the priests. They are what we must seek to eliminate." He has his own sense of right and wrong: "If we are to beat up anybody we should do it with justice and democratically." He is a great blusterer. When Stalin dies, he announces to his wife that, "In order to obtain peace, the western warmongers must be eliminated. And that means America, the Vatican, big businessmen, priests, land-owners, reactionaries, fascists, royalists, royalists, social-democrats, Imperialists, nationalists, militarists and intellectuals. It will take an enormous blood-path (blood bath?) to cleanse the world of this mediaeval residue. We must destroy a rotten old world in order to build up one that's healthy and new." "All right, Chief," she said, not mentioning the fact that in 1948 she voted for the Christian Democrats." He had fought with the partisans during war, and had "taken the tiller of the rocky township during the stormy post-war period, and while flying the red flag, had managed to keep the little boat on a straight course. For that reason, when election time came around, even those who saw communism as the path to perdition voted unhesitatingly for Peppone." As he put it, "Peace must be defended; with blows if necessary." He is bitterly opposed to the Marshall Plan and all things American, and, of course, strongly supports Russia, a place about which he does not actually know very much. When Camillo sends him a mischievous message that the Party are transferring him to Russia, he is very relieved when he finds that he does not really have to move. Spelling is not his strong point, and when he decides to take an eighth-grade examination alongside children to make up for his incomplete schooling, it is only with Camillo's help (his cheating, in fact) that he earns his diploma - even if he finds that, following Camillo's instructions, he ends up by writing an essay on "The Day of my First Communion" to do it. The two of them make excellent foils for each other. 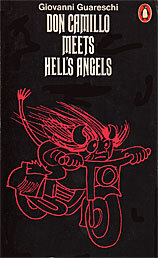 Don Camillo meets Hell's Angels (1969). American title: Don Camillo meets the Flower Children. There is a whole website devoted to the author at The Little World Wide Web Homepage of Don Camillo and a page on Wikipedia. His books are mostly out of print but used copies can be found. The first 5 books of stories are included in this 1981 anthology. 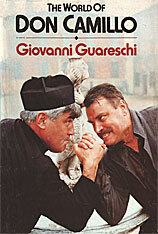 The cover photo shows Mario Adorf as Don Camillo and Brian Blessed as Peppone in the 1980 BBC TV series. Below: Fernandel appeared as Don Camillo and Gino Cervi as Peppone in a series of 5 French-Italian films made beween 1952 and 1965. The author illustrated his books with his own comic sketches, as seen on this Penguin cover.